Govanhill Baths Community Trust’s spring programme of Wellbeing classes are now open for registration. A wide range of FREE activities and classes, open to all, will be running from April to June. Govanhills Baths Community Trust’s award-winning upcycling project Rags to Riches have secured new premises for a retail outlet on Victoria Road. 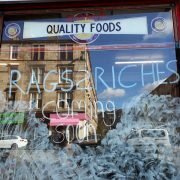 Our team are busy preparing the shop for a planned opening in May. Govanhill Baths Community Trust are delighted to announce that we will again be a venue for This year;s GI Festival, hosting Yon Afro Collective. Glasgow International is Scotland’s largest festival for contemporary art, taking place over three weeks every two years across the city of Glasgow. Renowned as a centre for contemporary art, the festival draws on the city’s strengths as a vibrant and distinctive centre of artistic production and display. 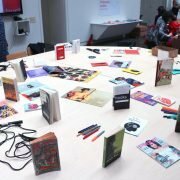 Combining the characteristics of a visual arts biennial with an open submission model for artists and curators based in the city, GI is a truly unique event in the European cultural calendar. Featuring Najma Abukar, Layla Roxanne Hill, Rhea Lewis, Sekai Machache, and Adebusola Debora Ramsay, Yon Afro Collective (YAC) seeks to amplify the lives of women of colour in Scotland and tell stories which are often ignored. Its latest project will consider how the Black Other is viewed. The installation will challenge the concept of positive initiatives, the performance of being ourselves, and align women of colour, Scottish and artist identities. 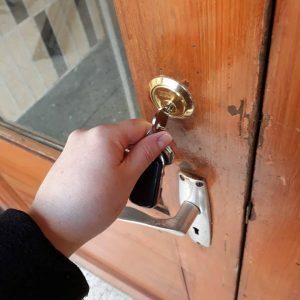 By presenting this alongside sculptural and other visual material, YAC examines our existence as resistance within social, political and geographical environments. The Board of Trustees of Govanhill Baths Community Trust (GBCT) are extremely disappointed that, for the second year in a row, The Scottish Government has decided not to support the refurbishment of Govanhill Baths through the Regeneration Capital Grant Fund (RCGF). 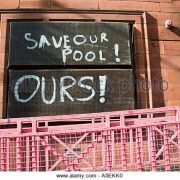 We believe that the reasoning behind the decision to not award funding to Govanhill Baths is inconsistent with other projects that have been granted funding previously and in this years awards. GBCT know that we meet all of the criteria for funding and that our project uniquely “fits the bill” for the Government’s flagship Community Empowerment and Regeneration strategies. 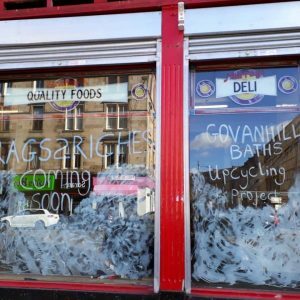 Nearly 600 people recently bought Community Shares in Govanhill Baths, those people are now the owners of the project and are a true example of a community “doing it for themselves”.